Money is something that touches most aspects of your life. You can’t avoid money — just like you can’t avoid food. Making bad decisions about your food intake can ruin your physical health, just as making poor money decisions can devastate your fiscal health. Fortunately, the human body has the ability to withstand a lot more abuse than your bank account or credit report. Maintaining good fiscal health takes an ongoing investment of energy, time, and persistence. Awareness and acknowledgment are the first steps to improving your spending habits. If you become conscious of your own tendency to spend money without thinking, you can make better decisions with that awareness. And most likely, if you knew you were making reckless, thoughtless decisions that could negatively impact your future, you wouldn’t do it either. So take a minute to ask yourself: Do you overspend? Maybe the answer is a resounding “Yes!” Or maybe you feel that you don’t overspend, or at least don’t do it regularly. Care to find out? To figure out whether you’re overspending, take our quiz. If you answered Yes to questions 1 and 2, you’re probably doing really well. 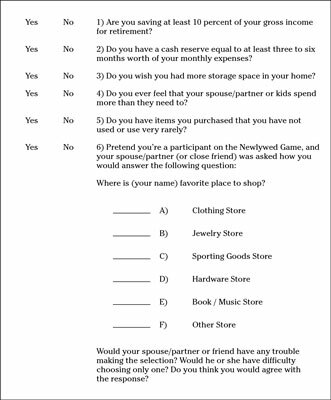 However, if you answered Yes to questions 3, 4, and 5, you or someone in your household has spent a lot more than necessary, and this excess spending may be a chronic problem that is keeping you from achieving your financial goals. Regarding the final question, if your spouse or friends jokingly tell people that you have forwarded your mail to your favorite store, you may be an overspender! If they debate about two or more choices, you may be an overspender! However, if you and your spouse or friends can’t quite figure out which store type would be your favorite, maybe you’re not a shopaholic at all. It can be difficult to change spending habits, even if you’re aware that these habits cost you money or are irrational, unhealthy behaviors. But it took a long time to get where you are now with your spending, and it is reasonable (and healthy) to recognize that becoming a healthier consumer will also take time, so don’t get discouraged if you’re overspending. In the modern classic, The Millionaire Next Door, the authors profiled dozens of self-made millionaires. These millionaires had several common characteristics. One characteristic trait they all shared is that they were thoughtful spenders. Another word for it is frugal. They saved a portion of every dollar they made. Would you rather look like a millionaire or have the financial security of becoming one? Most people can’t have both. This concept is not living within your means, but rather living beneath your means, which means you have money to save and invest.